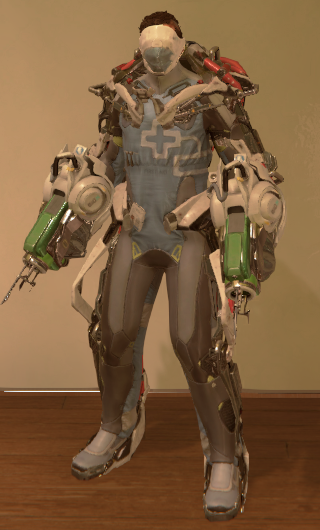 Asclepius Gear is a DLC Gear Set in The Surge. "Hailed as a much-needed revolution in curative wearables, this new line of Medi-Voltaic Gear™ was designed to give countless veterans a new lease on life. Its cybernetic muscle structure offers never before seen speed, precision and comfort, gently pushing its wearer to his limits without noticing the strain. CREO has been able to receive some of the earliest, highly experimental prototypes for selected test subjects willing to volunteer for a good cause." "Wearing a full set of Asclepius gear increases healing of Medi-Voltaic implants, while decreasing energy costs. In addtion to that, attacks restore health while enegry is full and such implants are equipped." Obtain by dismember specific enemies in the Executive Forum. There is one right outside of Jonah Guttenberg's office, another in the hallway leading to Don Hackett's broadcasting room. Requires Medi-Voltaic implant in order to be eligible for health regenerate on hit. Energy needs to be 100% full to grant health regenerate on hit. Energy amount does not affect healing granted from regenerate on hit (identical at 48, 96, 144, etc). Regenerate on hit is based on energy gain beyond cap, based on a factor of Medi-Voltaic level. Stacking energy gain with the highest level Medi-Voltaic implant can give decent health returns (50+ HP per hit). All the weapons that are visibly on fire will yield the best returns, and faster is better. Damage does not appear to be a factor, but type of hit does. Impact, attack speed, and energy reduction do not affect healing. Kinetic converter does not appear to trigger healing. SNS Disinhibiters do not stack. Medi-Voltaic implant given a +50% healing bonus (maximum 150HP healed with base game available implants).